For over a year, hundreds — if not thousands — of brave, passionate organizers and volunteers stepped into the ring with Goliath. They gathered the requisite signatures, secured a spot on the ballot, and spread the word to any voter who would listen. Then last night, with our collective fingers and toes crossed, we waited, hoping that a majority of Californians valued their right to know. Apparently 55% of my State’s populace doesn’t mind being part of our nationwide food experiment. The people have spoken. And this time they chose to consume genetically-modified foods. I can’t say that I was surprised by the result. Certainly disappointed, but not surprised. The day I saw my first No on Prop 37 television commercial, I knew we were in trouble. The commercial claimed that a Yes vote would increase food prices, that the argument against GM foods was unscientific, that just about every newspaper in the State had endorsed a No vote. Not once did I a see a pro-37 commercial to counter the above claims. Then again, I don’t watch a whole lot of TV. Commercials cost money, and Goliath has deep pockets. Money talks. Organic cow dung walks. While $6.7 million bucks is no small sum, Goliath can find likely find that number hidden between his oversized couch cushions. And that’s what I really want to talk about here. I imagine he was expecting me to say something more hippy-ish, like “we all need to come together and spread the word to the people”. Or something like that. While I love the idea of grassroots movements, I am equally endeared with greenback support. Because let’s be honest, just one of those No on 37 commercials likely reached more people in thirty seconds than my blogs, podcasts, and videos reached all year. And although I can understand it (because I’ve been there), the rampant poverty complex going on within our alternative health movement has to stop. Imagine what kind of impact we would make if just a hundred of the many thousands of real food bloggers, podcasters, speakers, and consultants turned their passions into thriving six-, seven-, or eight-figure businesses. Not by scamming people out of their money, but through serving others by adding value to their lives. I won’t hide it. My goal is to be filthy rich. I want to be the Shawn Carter (a.k.a. Jay-Z) of the health game. While Mr. Carter gets paid to make your head bob, I have no problem making your heart healthy and skinny jeans fit for a fee. The business model is the same. My products are my albums. The blogs, podcasts, and videos are my free mix-tapes. It’s the law of fair exchange — payment is due when products and/or services are rendered. Bloggers, if you live in fear of your readers and followers leaving you because you asked to be paid, then you’re breaking that law. They can call you a sellout (been there), or write you nasty emails about how health information should be free (done that), or post smear videos about you on YouTube (there now). They’ll call you every name in the book. But you’ll also be the one called upon when a worthy cause — like labeling GMOs — needs your financial support. How cool would it be if a hundred bloggers (at least) could each write substantial checks made out to the Non-GMO project? How much TV time would that buy? How many people would it educate? It’s time to stop playing small. Time to stop trying to make everyone happy. Go to iTunes and read the reviews for Jay-Z’s albums. They’re not all positive — not even close. However, by using his finances to help bring basketball to Brooklyn, he has brought a ton of positivity and spirit to the borough and its businesses. That’s what I call IMPACT. Sometimes it doesn’t come on the cheap. 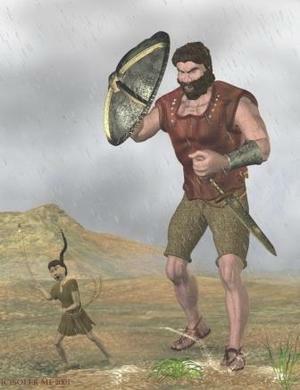 If we truly want to beat Goliath, we can’t show up with a slingshot. We must level the battlefield. I see a Joel Salatin commercial while watching The Voice. Kim and Kloey rock JERF t-shirts. Dr. Dre says “Kale Yeeeah!”. And if those don’t get the nation’s attention, I’m not opposed to running ads with hot girls posing all naughty with organic carrots and cucumbers. With each defeat there is a lesson to be learned. The defeat of Prop 37 has taught me that the next time around I need to do MORE. I played too small. I didn’t use my connections, voice, and online platforms as effectively as I could have and should have. I’ll take responsibility for that. There’s no one to blame but myself. But next time a cause this important comes around — whether in California or elsewhere — I pledge to put my money where my mouth is. And it is my greatest hope that my Real Health counterparts will have the means to do the same. We need more summits. More ebooks. More webinars. More e-courses. More live conferences. Mo’ money. There’s no way around it, peeps. Next time, Goliath goes down. This message has been approved by real foodies worldwide. I Want My GMO Check! This entry was posted on Wednesday, November 7th, 2012 at 2:34 pm and is filed under wellness. You can follow any responses to this entry through the RSS 2.0 feed. I’m in! Love your philosophy and your work and couldn’t agree more. Here’s to success – HUGE success – on all fronts!! I don’t look at this as the voters’ choice to consume GMO foods. Rather, I see it as a vote against the state meddling in the private affairs between to individuals agreeing to enter into a fiduciary agreement. Every person has the right to go out and choose whether or not to buy any given product. We don’t need the state dictating how we must run our businesses, since in most case, the market will do that for us. If we spread the word loud enough, long enough, more and more people will begin to vote with their wallets and stop buying the FrankenCrap these companies pump out. Granted, the state is still interfering in the markets by subsidizing the very inputs to these companies. Perhaps that’s where we need to focus our efforts. Rather than dictating what the manufacturers “must do” in the way of labeling, we should start dictating what our government “must not do”; i.e. meddle with the markets. Just like we don’t want the government in our bedrooms or our medicine cabinets, etc. we shouldn’t have them involved in our private financial transactions. If a women has the right to choose what she does with her body, the rest of us ought to have that right too. Therefore, we should be demanding the right to consume raw dairy and the right to access medical marijuana. And we should be demanding that the government not subsidize anything; from corn, wheat, and soy to oil or alternative energy. Let the free markets and consumer demand dictate what gets bought and sold. I think we’ll have a better chance of getting the government out of our wallets than fighting the industries and trying to dictate what they must do. Just my $.02. Feel free to flame away! This is round one back into training ,spreading the word , uniting ,for the next round. Time to dust the big gloves off and go for round two. So let’s keep pressure on President Obama to make good on the campaign promise years ago to label GMO !!!!!!! I like to eat healthy, but I don’t understand why there needs to be a law to force food providers to label gmo. Can’t companies do this if they so wish? Can’t you just boycott any companies that refuse to label? USDA organic is already a label system that is gmo free. I don’t understand why you want a law to out someone in jail for refusing to label, when companies are already free to label if they want. With u Sean. Can u make a t to wear in tx or the whole us to get obama to live up to his promise? For PaulL – Disclosure: I worked on this campaign in early days: collecting signatures to get it on the ballot. That the prop lost with a 5% difference is enough to send it down to defeat but not to conclude more than it was a Monopoly game played by big business with deep pockets. Prior to the commercial media blitz, the Pro ranks were clearly ruling the day. But broadcasting carefully engineered lies in heavy rotation will confuse enough people to tip the advantage to their side. It was not a referendum on people vs. government intrusion into their lives. Labeling ingredients allows for consumer choice whether is is MSG, sugar content or nutritional data. Labeling GMO ingredients does not stop ANYONE from choosing to eat it. It simply allows consumers to be informed about (unseen) ingredients in what they are eating. Amen brother – the movement has to be driven by money as well as passionate people. Great blog – real talk for the real food movement. So, so sad. I am a mom of two young kids who supported the campaign by attending rallies, putting up yard signs around the community, Plastering info around community mail boxes and speaking to other moms and dads at school. As I talked to others I came to the conclusion that people who eat foods that are GMO, don’t WANT to know. If they look in their pantries and see a GMO label on all their food they might have to be faced with their demons. People don’t want their faults pointed out. They want to be kept in the dark believing that “ignorance is bliss”. If there are no labels, there is no personal responsibility and their lives can be filled with all the Kashi cereal they want as they ignorantly believe they are eating “healthy”. This is a sad day. Sean, we didn’t really lose- we gained quite a bit. The opposition’s sound bites have given us valuable insight. The charge that there were inconsistencies is well taken. Anything we put into our mouths should be labeled, including the meat from animals fed GMO grains. No exclusions. Food will be more expensive. Its not the cost of the label per se. We already have food that’s GMO free and more expensive. Its called organic, and we’re already paying the price. Labeling doesn’t mean that the manufacturers can’t keep using GMO, but if they think that they will lose sales if they don’t replace the GMO ingredients, then they are admitting that people will prefer them without and yes, the price of processed foods will go up if they do. Some foods are already being labeled as GMO free, and we can vote with our dollars. Lawsuits will abound. This tells us that its time to pressure our elected officials to get back on the bandwagon and, with the current high interest, get a national labeling law passed. The government should be enforcing the law, not individuals bringing lawsuits. So, Barbara Boxer, lets talk. Totally agree with you on ending crop subsidizes! We are in effect subsidizing the food processing industry. Teille, you hit the nail on the head! What you have so beautifully worded here is the absolute truth! That is really what is going on with a lot of people. Also I might add, that once people heard the commercial, stating that their food bill would be $400 more per year, (which is false) that is what prompted many people to vote no. They didn’t want to pay more for food. Yes, this is a sad day!!!! Loved the part how your blogs are your mix tapes. Great analogy! With the knowledge that it matters not who votes, but who counts the votes, I am not so sure the results are valid…particularly if electronic voting was a part of the equation. That being said, using illuninati satanist J Z to illustrate your point was about the very worst of choices you could have made. I’m Canadian, but I was so so hoping that this would be a success…needing to label all the GMO products! But really, this is only a band-aid solution. It’s more the ability to force companies like Monsanto to become accountable. I find it so hard to understand how commercialism seems to over-ride common sense. After all, it”s a known fact that over 90% of the population want to know which foods are GMO. And the cost of $400 more per month??? how much is the cost of all these fairly new sicknesses such as cardiovascular disease, cancer, diabetes, and obesity? Honestly, I truly believe most parents would gladly pay an extra $400 a month as an insurance against those diseases. I am with you all the way. I have bought my JERF shirt and wear it proudly. I bought Paleo Summit will buy the Real food summit, I am ready to change careers into wholelistic nutrtion, just trying to find a way in, and get my self together so I can be my own best advertisement. Firstly, we need to educate people. The anti-labelling ads were aimed at the ‘lowest common denominator’ thinking. Not everyone is a conscious consumer and probably never will be. It is of course a huge pity that the tipping point was not reached this time around. One needs to see this as a battle lost, but not the war. We need to press on. This is not just a USA problem, by the way. In my country, Dow BT corn (with an ‘agent orange’ pesticide in the kernel) has just been approved for human consumption. Corn is a staple food of around two thirds of our population. They have no idea about gmos and generally live on the poverty line. A positive vote in Califoirnia would have helped us all in this fight. Secondly, we live in the age of transparency. We need to use the tools available to spread the message. A movement can become unstoppable. Legislation can also be a crutch, so the movement (for labelling) can aim to get stronger using today’s technology. David can defeat Goliath’s expensive blanket advertising. For example, ‘elabelling’ using smartphones can scan a barcode on a product before it is purchased, link to a website, even to a database with reviews and blogs on the product. This technology is already working. Out of defeat can come victory. In the meantime we still have to deal with big bully Goliath. I live in a farming community, daughter of a farmer. We use chemicals in our groves , we also raised 28 children, including Grands on the land and our Great Grandmother lived to be 105 eating all that BAD food. Granny is now 87 and healthy as a horse. I am still growing and feeding my family and many other families and don’t need to be told how to do it by folks who promise “you will die” and “your brain will be fried” with absolutely no thought to the possibility that we may know what we are doing. Get real, people dont’ want you in their supermarket telling them they have to drink Soy milk and eat nuts and twigs. Free choice America! Even in California, GO FARMERS! DAVID & GOLIATH: It’s not about meeting them dollar for dollar. It’s about the truth. It’s about respecting ourselves and our environment. If our citizens in all 50 states bring this labeling issue to a vote, will the corporations against it spend $45 million in each state to lie and defeat it? Our $5 million went a long way to gain 47 votes to their 53! I like DAVID’s odds. It’s our voice and actions nationally that will win clean food, air and water. GOLIATH wants this. We must improve our efforts to help him unclutter his mind with biotech solutions, to honor and respect a new partnership with nature. The Soviet Union changed and so will profiteering-at-all-costs corporations. Stay true to our purpose and be patient. Thank you. It’s astonishing to me that so many people just don’t care what they eat. I did vote for the ballot measure, but I was not the least bit worried my food bill would go up, as we were told. Even if I passed it would have made no difference for me, since I purchase no commercially prepared foods. I eat only organic from a local produce CSA, and source my meat from various local farmers. And the rare things I buy at the grocery store like tomatoes, mustard, maple syrup etc., are single ingredient items, and always organic. I am sure I am not alone in this way of eating. Yes it is truly sad (SAD?) that California voters are so stubbornly attached to a decidedly absurd mindset. We must continue to educate and reveal the true nature of what GE foods are all about. And, to respond briefly to the GO FARMERS poster, this was not about the use of pesticides and fertilizers. It was about revealing the ingredients that were GENETICALLY messed with. I don’t think you really get it…it’s not about you and Granny living to be 100, it’s about everyone who want’s to live that long, living to 100. The continual application of industrially produced, toxic chemicals on our food is unconscionable. Eating this way; We Don’t Have A Choice. It’s in the food we eat and we cannot avoid it. Chemicals make the chemical companies richer….they don’t make us healthier. Think about it and look around; you will see what the chemicals are doing to the people who are not able to make a choice. The problem with the campaign was that word didn’t get out. Yet, there were many ads (various sources) asking to vote against it. It seemed that everywhere I went on the internet there was ad space touting the dangers of voting for Prop 37. I spoke to more than one person that merely voted against it because they didn’t want any increase in government spending. They had NO CLUE what it was. I’m sure you’ll have your goals come true, because you’ll MAKE them come true! Sandy Logan, you are setting up a false Straw Man argument. Prop 37 didn’t tell anyone what to eat. But you can’t have free choice if you don’t know what you are eating. Prop 37 was all about enabling INFORMED choice. What amazes me is that 45% of voters want to be told something, and because 55% don’t care, the people who do stay in the dark. where I come from, if 5% of the population had a need to know some piece of information and expressed the wish this openly, that information would be supplied.